It’s been a while since I’ve shopped at LOFT, but they’re having a huge sale right now with 50% off everything! I found a few winners from my recent orders including this boucle dress and this draped sleeve blouse (SO cute when on – can’t wait to show it!). This dress is stretchy and comfortable for all day wear or travel, and can be styled to look more expensive than it actually is. Try it with a pear brooch and sleeveless collared blouse layered underneath, or with a cropped blazer like this petite-friendly one. The textured boucle knit features black, blues, and cream and I like the subtle fringe along the neckline and sleeves. My one complaint is only the torso is lined, so I have to wear a slip skirt underneath when wearing tights to avoid the dress clinging to my tights! Measurements of 00 petite: 16″ across armpits, 13″ across waist, 17″ across hips, 33″ length. The waist is a little loose on me, so I prefer this dress accessorized with either a slim or statement waist belt. ASOS is awesome for petite-friendly belts (like these or these), as they actually make down to an XXS to fit waist sizes 22 inches and up! Are the dres’s pockets real? Wow! Love those tights. Usually, I feel like tights are too sheer for me, but those look really opaque. Also, love that you paired the Gucci belt with the dress. Hello! Any dupes for the Gucci belt? Looking for a similar style at an affordable price point. Thanks! Double circle belt is a great idea. I don’t like wearing brand logos, so this mimics belt with focal point minus the brand. Oh that dress is really super pretty and classy! Loved how you elevated the look with that Gucci belt and I am obsessed with your handbag! Your tweed dress is super beautiful! Love the dress, and that coat! It’s gorgeous! I am a similar size to you, and my problem with a lot of dresses/skirts from LOFT or Ann Taylor is that the skirt is usually not tapered enough to give me that pencil dress shape that I like. I know you usually have your tailor take in pencil skirts/dresses — did you have that problem on this dress or does it fit like this off the rack? Thanks! Hi Steph! Agree, I love bottoms that taper in more but after getting some of my pieces tailored, I did have some trouble getting in and out of higher cars haha. This dress does not taper in at the bottom – mine measures 17″ across the bottom opening (not factoring in a small slit) which is the same width as the hips. I think it looks tapered in some of these photos when I’m walking since one leg in front of the other will pull on the bottom a bit! How are you not cold? Or do you take your jacket off just for photos? I live in southern California (it’s in the high 50s right now due to rain for a week), and I don’t ever take my sweater off, even indoors! This is a great dress! I think this could transition nicely to spring too without the tights. Would you wear this with navy tights and if so would you pair with a navy shoe too? I like the idea of navy tights, but struggle a bit with the color of shoe…same goes for gray which i think is beautiful in tights. Hi Leslie, yes absolutely – I love doing navy tights and navy shoes and same goes with gray with similar toned shoes. Navy tights with dark gray or black shoes or vice versa also work! I know some don’t like pairing black with blue but the textures on this dress is a good example of how it works. Love the look! Also wanted to ask where are your sunglasses from? Thanks, Karen! They are Celine audrey. Thanks so much for the info, Jean! Are you wearing the “Audrey” or “Baby Audrey” size? I’m wearing Audrey, BUT, they are definitely oversized sunglasses. I tried on both the Audrey and Baby Audrey and spent so long hemming and hawing between the two. If you have a petite face or a lower nose bridge (which some brands used to call “Asian fit”), the Baby Audrey fit better, without a doubt. But I fell in love with the more dramatic oversized look of the regular Audrey, so got those even though they don’t fit as well. Just wanted to share in case you were considering ordering somewhere without the chance to try them both on first! Thank you so, so much! That is such helpful guidance, as I’ve been struggling between the two sizes (you hit the nail on the head!). Love the look! Wanted to ask – where are your sunglasses from? Hey Jean! Have you ever ordered belts from ASOS, and if so, what size did you get? I think we’re about the same size (I’m 4’11” and weigh about 100 lbs), and I have the hardest time buying belts! Hey Jennifer, I have not ordered belts from ASOS but I shop there all the time and their sizing usually runs smaller than US brands. I think I would be an XS in their belts. Thankfully they have free and easy returns though which I use quite a bit! Also, in regards to Nori’s eczema that I saw on your Instragram and because I don’t have an Instragram account, I wanted to share my tip about Vaseline/Aquaphor baths here. Check out the instructions from the link below. Just make sure you change out the bath water after using any shampoo or soap so it does not irritate her skin. Also be careful because she will be slippery when you pick her up, as well as your own hands. It really helps to lock in moisture especially in the dry winter months. Hi Angela, thanks for sharing! Our pediatric dermatologist has us dousing her in vaseline immediately after bathing while still wet, but I have never heard of bathing with vaseline applied – very interesting! Yes, I’ve also applied Vaseline/Aquaphor right after a bath and while still wet but I noticed there is a difference in how much more the skin retains moisture when applying it DURING the bath. I forgot to ask what types of layering piece (color, type) would you wear over the dress? 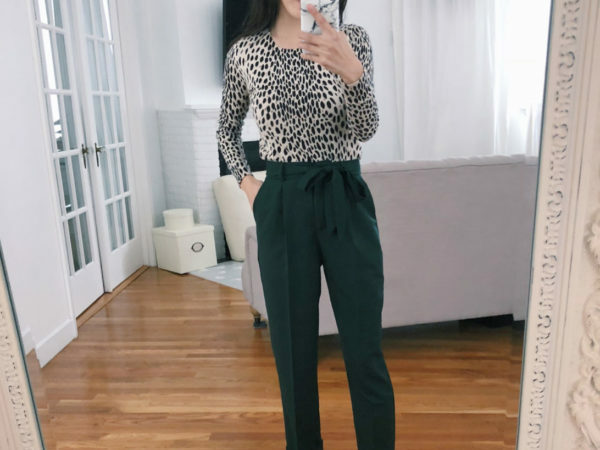 Black cropped blazer from express (linked within the post above) looks nice with this, but a navy cardigan or blazer also works! In warmer weather I’d go bare legged and do a white jacket. Great look! Is the Hermes Kelly new? Can you share how you went about purchasing it? Thanks! This dress is sooo elegant and chic <3 🙂 It's the perfect dress to wear to work, especially if you have a meeting! Love how you styled it! This is not fashion related but I have to ask- what are you doing to get those amazing calves?? I remember a pickle ball post last year, but do you run or cycle or something? I would love for you to do a review of teddy jackets! I’m finding it really challenging to find one that is petite friendly.